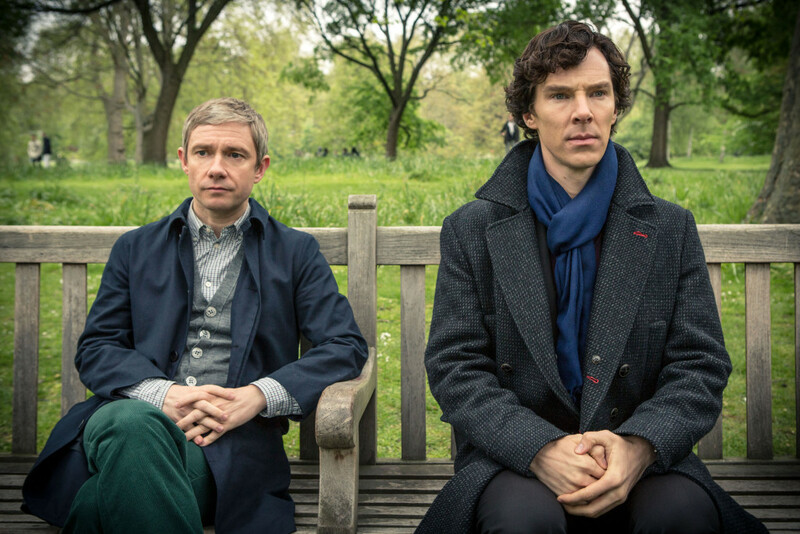 In January, after a three year hiatus, BBC hit series Sherlock returned for a fourth season — and what a season it was. Obviously, spoilers ahead. The fourth season, which began on a bright note — seeing Mary and John have their first child and name Sherlock the Godfather — took a very dark turn as Mary is killed at the end of episode one, a new villain tries to kill Sherlock, and it’s revealed that Mycroft and Sherlock have a sister, Eurus, who’s been locked away in a high security prison. Needless to say, it was a lot to digest. While the season was very dark, behind-the-scenes photos from the season have emerged on Twitter and the cast seems to be having a *blast* filming the hit series. The photos, which were on display over the weekend at the Sherlocked USA convention, feature the cast filming and hanging around the set. The photos feature Benedict Cumberbatch posed in costume with his on-screen brother (and Sherlock writer/co-creator) Mark Gatiss and Martin Freeman and Amanda Abbington posing with the Sherlock crew. Abbington and Louise Brealey also hung out on Mrs. Hudson’s gorgeous red Aston Martin while Andrew Scott, who made his grand reappearance as Moriarty hammed it up for the cameras. While it remains to be seen if Sherlock returns for a fifth season, we hope to see our favorite British private detectives back for at least one more season — with the hopes of many more amazing behind-the-scenes pics. We’ll take every hilarious photo of Andrew Scott that they’ve got.